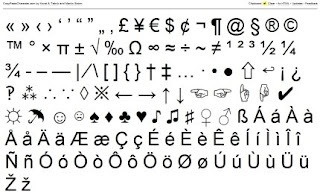 Sometimes we need type special characters if you want make reader fun, like ☜, ☼, ☂, ☺, or some currency characters £, ¥, €. How can you type these characters by your keyboard? Actually, I do not know. But you can copy and paste them from other people who posted on a webpage. Copy Paste Character puts them together on one page, so you can copy and paste to your compose page. It is nice and useful. You do not need remember every single character, just bookmark Copy Paste Character, you can copy them if you needed anytime.